Find out how you can prepare for flooding. Altering its design to relate more to the existing hotel. Through this decision, Council did not require that the addition be changed to a Château-style building nor that exact architectural elements be copied from the existing hotel. You may view all of the plans and studies that the City of Ottawa has received as part of the site plan control application on Development Application Search. You can provide comments by contacting the file lead. Please provide your comments by Monday, March 18. The architect will present the revisions to the Urban Design Review Panel for comment in March 2019. City staff will prepare a site plan report for presentation to the Built Heritage Sub-Committee and a decision by Planning Committee in spring 2019. The applicant will seek National Capital Commission approvals for matters related to federal lands. The Committee of Adjustment will make a decision on the minor variance application. Larco will obtain a building permit and construct the addition. 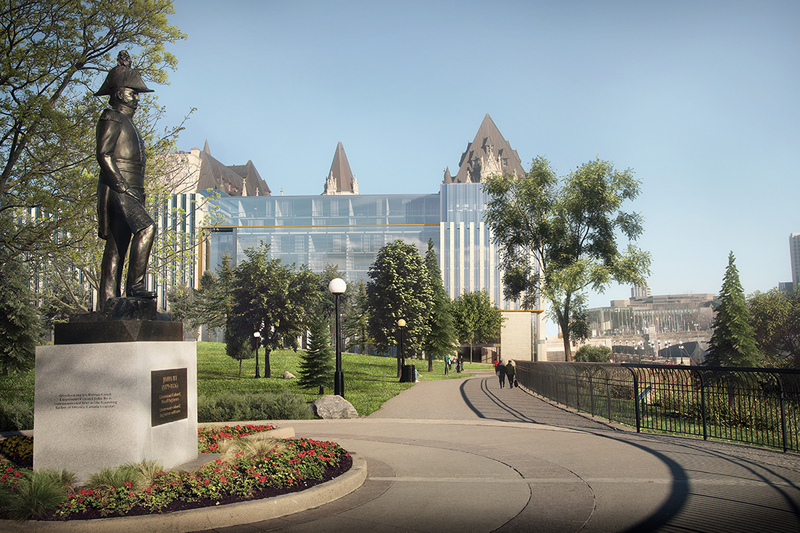 The City received a site plan control application for an addition to the rear of the Château Laurier in December 2016. Planning staff requested comments from the public and interest groups through two formal circulations (winter 2017 and winter 2018). Council approved the demolition of the parking garage in January 2018. A revised design was submitted and Council conditionally approved the application to alter the heritage building in spring 2018. This As We Heard It Report [PDF 475 KB] summarizes the completed feedback form submissions. City planning staff have read all of the public comments received and have updated the Frequently Asked Questions in response. The City also convened a group of heritage professionals to provide expert advice on the design of the addition. The Heritage Working Group met three times between February and April 2017, and offered design feedback directly to the architect and design team. Staff from the City and the National Capital Commission, and the property owner were also present at the meetings of the Heritage Working Group. On January 31, 2018, City Council approved an application to demolish the garage of the Château Laurier. The garage was structurally unsound and the applicant planned to demolish the upper four storeys, leaving a surface parking lot for guests. In response to these comments, Larco submitted a revised proposal in February 2018. City staff held a community meeting on February 28, 2018, and approximately 80 people attended. You may watch the presentation on Rogers TV. The design should be bolder. The addition will alter sight lines along Mackenzie Avenue. The property is within a Design Priority Area and the Site Plan Control application was subject to the Urban Design Review Panel (UDRP) process. The architect and the Larco team presented their proposal to the UDRP at a formal review meeting on March 1, 2018, which was open to the public, and at a focused design review session on April 10 with City staff and three panel members. The March 1 recommendations and both sessions informed the changes within the May 2018 revised proposal. 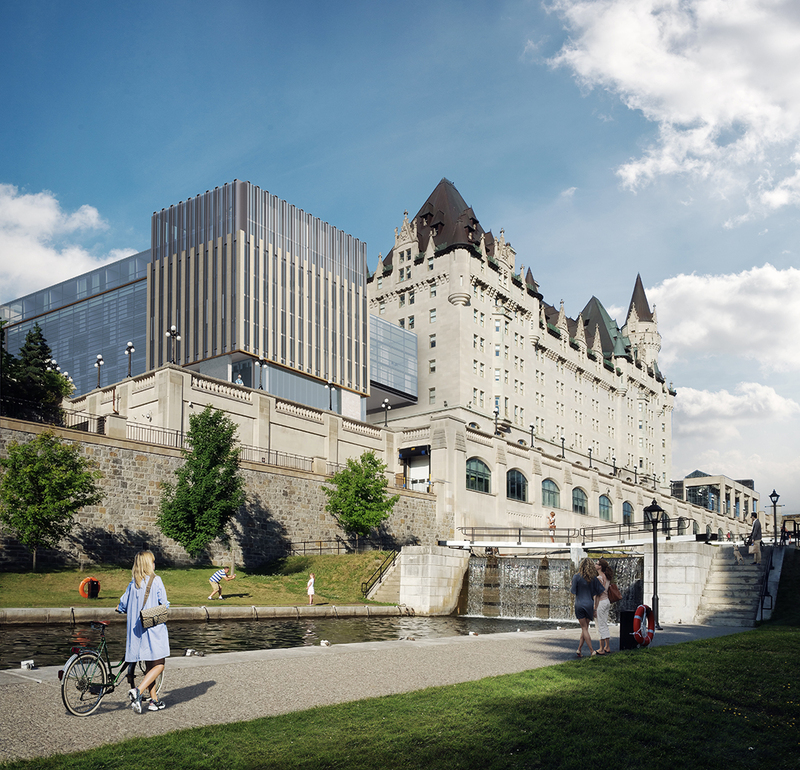 In May 2018, Larco Investments submitted a proposal for a seven-storey, 164-room addition at the rear of the existing Château Laurier. 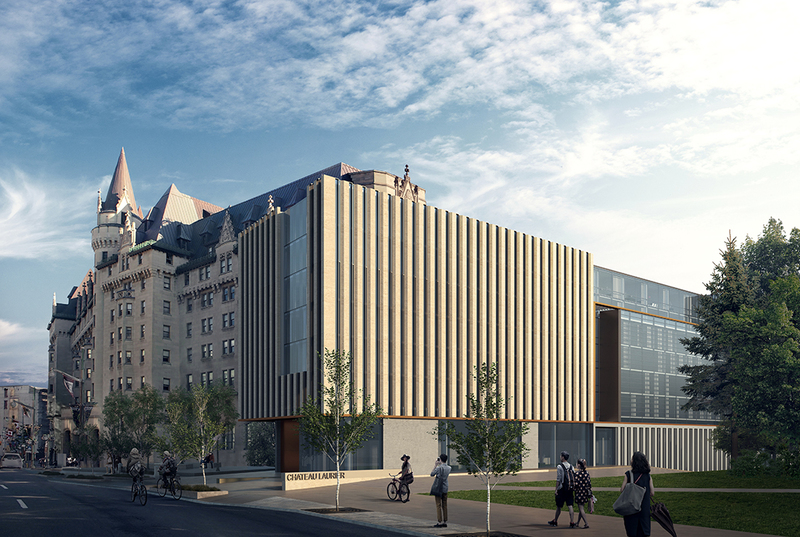 The development proposal retains the Château Laurier in its entirety, and replaces the remaining walls of the parking garage with an L-shaped addition, which will abut limited areas on the Château Laurier’s east and west wings. City staff supported this design and wrote a report with recommendations to the Built Heritage Sub-Committee (BHSC). On June 27, 2018, City Council gave conditional approval to the application to alter the Chateau Laurier at 1 Rideau Street, a property designated under Part IV of the Ontario Heritage Act. The Built Heritage Sub-Committee had recommended approval of the addition’s massing and location and the proposed landscaping, but indicated that more work was required to make the addition more visually compatible with the existing hotel. The sub-committee directed staff to work with the applicant to visually and physically break up the massing of the addition as seen from the north. There was also direction to increase the amount of limestone used and to ensure that all façades draw inspiration from the window patterns and architectural elements of the historic hotel. To address the conditions of the heritage permit issued in June 2018, Larco Investments altered the exterior design of the proposed addition and submitted new plans in February 2019. The north façade of the addition has been divided into three asymmetrical parts: an east pavilion, a connector and a west pavilion. The pavilions are clad in Indiana limestone and the connector between them is glass. The addition has bronze accents. The base of the addition includes some granite, which is similar to the existing building’s east wing. The addition has varied setbacks along the north property line to add visual interest and the top two storeys of the connector have also been set back. The north entrance facing the park is now defined by a double-height entryway. The hotel rooms above this entrance were removed to create a lobby space at the elevators and to make the historic building visible through the addition. There are now 147 rooms in the addition, reduced from the 164 previously proposed in June. 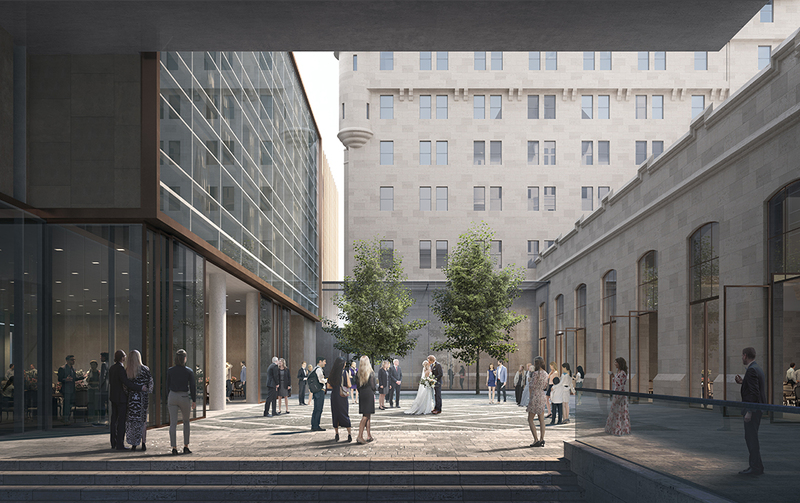 There are new exterior pathways, interior corridors, entrances and publicly accessible spaces, including a courtyard and a staircase that links to the Rideau Canal terraces. Parking is within the five-level, 361-space, underground parking garage. The functionality of the Mackenzie Avenue forecourt for loading and deliveries has been improved and street trees and landscaping have been added. Larco Investments proposes to build a seven-storey, 147-room addition at the rear of the existing Château Laurier. 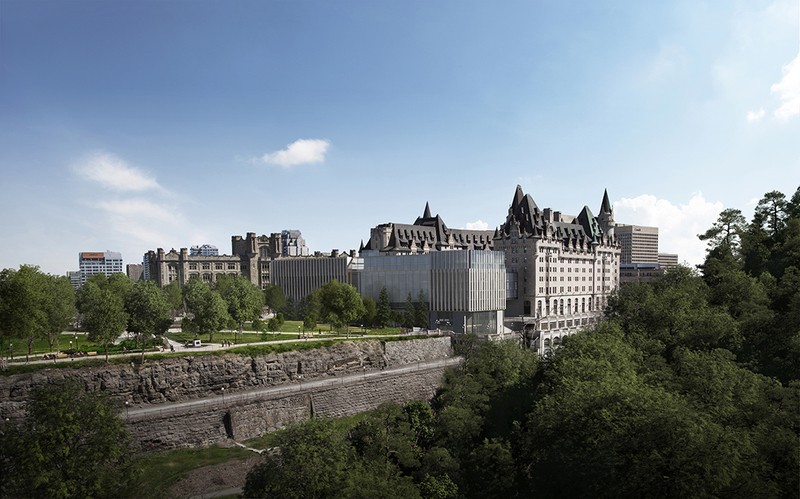 The development proposal retains the Château Laurier in its entirety, and replaces the remaining walls of the parking garage with an L-shaped addition, which will abut limited areas on the Château Laurier’s east and west wings. This proposed addition will also be connected to the existing hotel via an enclosed glass link running along the western edge of the hotel’s east wing. 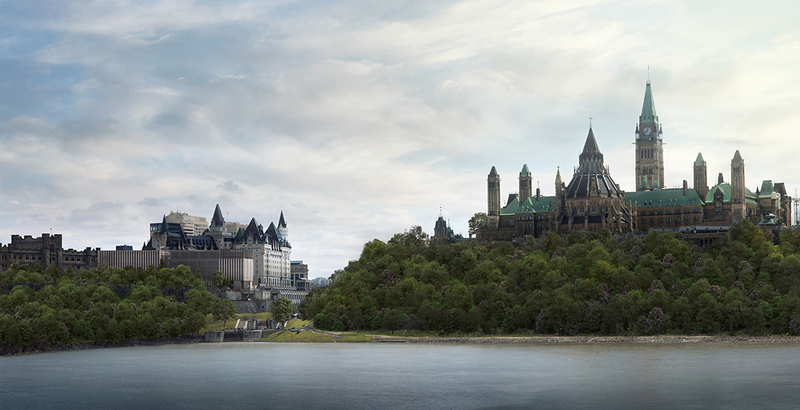 The development proposal also includes a landscaped courtyard between the Château Laurier and the proposed addition, modifications to original ground floor window openings to provide access to the courtyard from the hotel ballroom and banquet room, and a new stairway that will provide access to the courtyard from the public terrace on the west side of the Rideau Canal. The seven-storey height will enable views to the original hotel building, especially the iconic roofline, from Major’s Hill Park and other key vantage points. The ground floor will include hotel meeting rooms, as well as publicly accessible space. A long gallery along the north wall will create a visual connection between the addition and Major’s Hill Park to the north. The north-west corner will open to the lower levels of the Rideau Canal terraces. An accessible staircase is proposed, leading from the hotel’s interior courtyard to the canal terraces. A three-storey link is proposed above the staircase, attaching the addition to the existing building’s west wing. 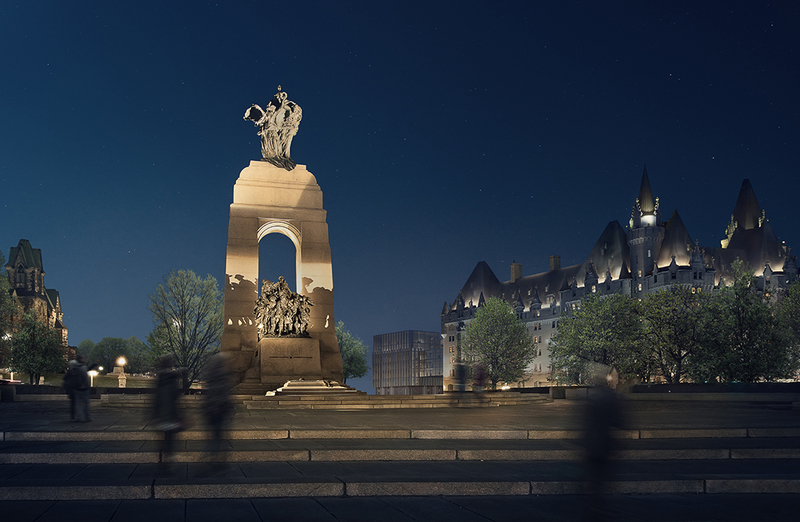 The 12,037 m2 site is located at the northwest corner of Rideau Street and Mackenzie Avenue, along the Confederation Boulevard ceremonial route. There are existing driveways accessing parking and drop-off areas from both streets. The site is designated Central Area within the City of Ottawa Official Plan and is within the Canal Character Area of the Central Area Secondary Plan. The zoning is Mixed Use Downtown, subject to a maximum floor space index of 4.5 (MD F(4.5)). The site is also subject to the Heritage Overlay. The Château Laurier hotel was built originally between 1908 and 1912 by the Grand Trunk Railway Company in the late Victorian French Château style. A wing along Mackenzie Street was added in 1929. The parking garage structure was added in 1969, and, in 1985, Rideau Street drop-off area was enlarged and a glass front was added to Zoe’s Lounge. A minor variance application will be required because the proposal does not meet the zoning. A site plan control application is also required. The Planning Act is the law that allows the City to pass a site plan control by-law [PDF 184 KB]. The site plan control by-law is a legal document that sets out whether development can proceed with or without site plan approval. The site plan control process allows the City to influence land development so that it is safe, functional and orderly. It is also used to ensure that the development standards approved by the City and other agencies are implemented and maintained. To determine if a proposal qualifies for site plan approval, staff complete a comprehensive review of plans and studies submitted with the site plan control application [PDF 1.03 MB]. Technical agencies, ward councillors and the public all inform staff’s decision to approve, modify or refuse an application for site plan control. Building location, landscape treatment, pedestrian access, drainage control and parking layout are a few of the items addressed during review. Certain site plan proposals are subject to the City's public notification and consultation process. A large sign summarizing the proposal is placed on the property to notify the public that an application has been received. Registered community organizations enrolled with the City are also given notice when a site plan proposal is received in their neighbourhood. Detailed information about proposals that require public notification and consultation, including a copy of the site plan is available online. Any person who wishes to provide comments to staff for consideration may do so within the designated comment period. Refer to the review status online to determine if the comment period for an application is in progress. To submit comments to staff, select the application number from the list of results. An option to send comment is located on the details page under the heading, file lead. If there is significant interest in a proposal a community information and comment session may be held. Applicant arranges a pre-application consultation meeting with City staff. Meeting is mandatory if the proposal is subject to public notification and consultation. Applicant submits a complete application with studies, plans and fees to a Client Service Centre. Study, plan and fee requirements are outlined during pre-application consultation. Refer to the City's Guide to Preparing Studies and Plans for information on preparing these requirements. A file lead is assigned to manage the review of the application. Details about the proposal are sent to technical agencies, public bodies and the ward councillor for consideration. After the comment period ends the file lead discusses the outcomes of consultation with the applicant. Any modifications to the proposal are updated on the plans submitted to the City for approval. Approval of Site Plan Control applications is delegated to City staff by Council. Councillors have the authority to withdraw this delegated authority. In these instances, the application will be placed before either the Planning Committee or the Agricultural and Rural Affairs Committee for a decision. If the applicant disagrees with the conditions of approval, they may file an appeal to the Local Planning Appeal Tribunal. In accordance with the Site Plan Control By-law [PDF 184 KB], the applicant enters into an agreement or undertaking with the City. The applicant has up to six months from the date of approval to sign a Letter of Undertaking and up to one year to enter into a Site Plan Agreement. As part of the Agreement the applicant provides a development cost estimate to the City so that financial securities can be calculated. Securities are held by the City to ensure that construction is completed in accordance with the approved Site Plan. The applicant provides the City with the required securities in the form of a bank issued letter of credit. The applicant also supplies a certificate of insurance to protect staff completing work on private property. After construction is complete, the development is inspected by staff for compliance. Securities are released if the built project complies with the approved plans. The Committee of Adjustment is authorized to consider applications for minor variances from a zoning by-law under Section 45 of the Planning Act. Minor variances are often necessitated by circumstances peculiar to a property which prevent the owner from developing it in a way which conforms to a zoning by-law. Examples of minor variance applications include requests for relief from the building setback, building height, and parking provisions of a zoning by-law. The Committee will refuse an application if, in its opinion, one or more of the above criteria have not been met. The Committee cannot grant exemptions to the by-law which, in effect, would constitute a change of zoning. In such cases, property owners may wish to make an application for a zoning by-law amendment. Any addition to a designated heritage building requires the approval of the City of Ottawa under the Ontario Heritage Act. The property owner must submit an application to the Planning, Infrastructure and Economic Development Department. Once the application is deemed complete, City staff issue an acknowledgement letter to the applicant. The Ontario Heritage Act requires applications to be processed within 90 days of the issuance of this letter. City staff will notify the ward councillor, local community association and Heritage Ottawa of the application and ask them for formal comments. Adjacent property owners will be notified of the application by letter informing them of the dates and times of the Built Heritage Sub-Committee, Planning Committee and City Council meetings. City staff review heritage applications to ensure that they respect the heritage character of the designated heritage building. City staff review proposals against the Statement of Cultural Heritage Value for the building and the Standards and Guidelines for the Conservation of Historic Places in Canada. They also review the Cultural Heritage Impact Statement prepared for the proposal. The Planning, Infrastructure and Economic Development Department will make a recommendation to the Built Heritage Sub-Committee, Planning Committee and City Council on the application. Land use planning is described and illustrated in this section including how the Official Plan and master plans guide growth. The challenges facing our growing city and the building blocks needed to attain our goals are also highlighted. The goal of this program is to build a strong relationship between the City and its communities and provide residents participating in the land-use planning process with knowledge and resources. Planning, Infrastructure & Economic Development Dept.